The latest beta version of cudaminer has support for the Blake-256 algorithm available, however there is still no official release available compiled for windows that has the new code with Blake algorithm support, so we have compiled it and provide it to you for download. 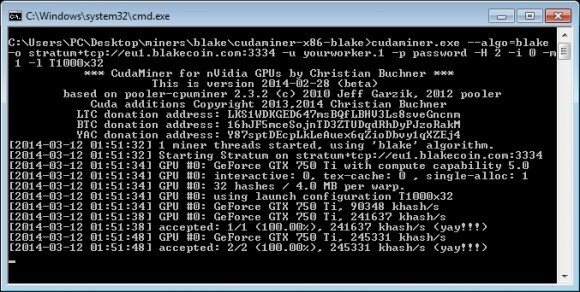 So far the Blake-256 algorithm is only used by two crypto currencies – Blakecoin (BLC) and Photon (PHO), but the good news that if more come out you will be already ready to mine them with Nvidia GPUs as well. Note that the hashrate you will be getting mining Blake-256 crypto currencies will be in megahashes and not in the kilohashes range and that is pretty normal for this algorithm. Mining on AMD GPUs will still bring significantly higher performance than on Nvidia, but still you can mine on Nvidia as well.